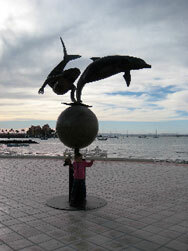 The seaside city of La Paz is known as the gateway to the Sea of Cortez! It is the perfect blend of tourism and local culture. Unlike Cabo San Lucas, Xtapa or Cancun, La Paz is NOT just a string of luxury resorts clustered along white sand beaches catering to tourists. 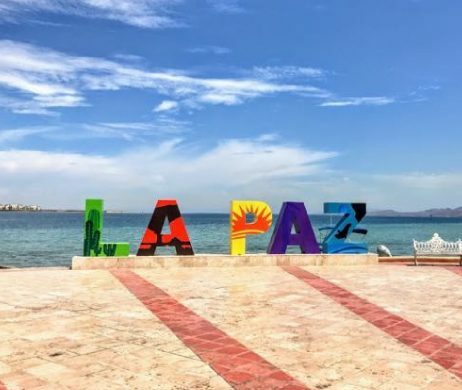 In La Paz (population around 250,000) you’ll find Mexican Families and Latin Lovers mixed with tourists all enjoying a stroll along the waterfront boardwalk known as the Malecón. This tiled boardwalk sports a variety of beautiful sculptures stretching four miles along the bay of La Paz on the Sea of Cortez. Our hotel, Posada LunaSol, and adventure travel office of Mar Y Aventuras are conveniently located behind the Marina La Paz only a few blocks from the west end of this picturesque sea-side walk. Here you’ll find the perfect blend of adventure travel, culture, art, music, food, drink, fun and beauty. During your stay with us be sure to book a snorkeling tour with whale sharks and sea lions, a kayaking tour to the beautiful island of Espiritu Santo as well as enjoy a stroll, run or bicycle ride under the palm tree lined sea-side walk of the Malecón. La Paz is the gateway to some of the most spectacular natural areas in the Southern Sea of Cortez and Baja presenting a plethora of recreational activities for a variety of interests. Just north of this lovely seaside city lies the National Park of Espiritu Santo Island (ESI). This desert island is adorned with large bays lined with white sand beaches, caressed by turquoise waters and towering cactus as backdrop. ESI is an ideal location for sea kayaking, camping, hiking and boating. 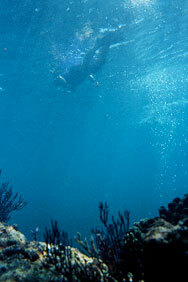 The surrounding waters of the Sea of Cortez provide a rich marine ecosystem for snorkeling, scuba diving and fishing. 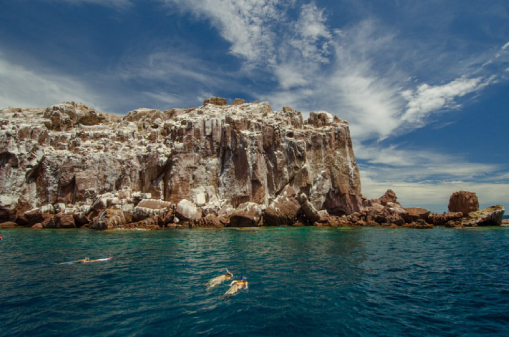 Year round a small rocky outcrop off the tip of the island offers the snorkeler or scuba diver the experience of a lifetime swimming with friendly and playful sea lions while enjoying their curios and animated behavior. During the fall and winter months the world's largest fish, the whale shark, frequents the waters of La Paz bay giving folks the opportunity to swim with these gentle, toothless, plankton feeding sharks up close and personal. In mid-winter a short drive across the peninsula to the Pacific Coast and Magdalena Bay allows visitors the opportunity to witness the pacific gray whale migration with close encounters of these gentle giants in their breeding and birthing grounds. We have been operating guided sea kayaking, snorkeling and fishing day and multi-day trips and renting kayak equipment to experienced paddlers since 1993. Let our expert staff help you book your guided excursion or rent equipment during your stay at our hotel so you can explore these rich marine and desert ecosystems for yourself. Todos Santos, designated a Pueblo Mágico, is only an hours drive from La Paz on the Pacific Coast. This quaint and tranquil artsy town presents a great day trip from La Paz where you can walk cobbled stoned streets and enjoy a great meal in one of its many fine restaurants while shopping for artisan crafts. Just south of Todos Santos you'll find world-class body and board surfing beaches. 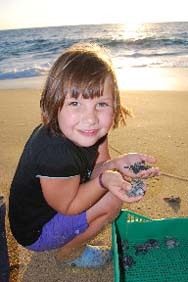 Head to La Cachora beach during the fall and winter months and become part of a local turtle conservation organization releasing baby turtle hatchlings each evening. If the ocean isn't your thing head into the nearby mountains surrounding La Paz where you can hike, bike or simply gaze up at the towering cactus. The sierra de la laguna mountain range south of La Paz is the perfect playground for hiking and biking. Explore its arroyos full with giant granite boulders and swim in the clear mountain pools (cold and hot) lined with tall palm trees. Whether you're an outdoor enthusiast who enjoys sea kayaking, hiking, bicycling, snorkeling, scuba diving, boating or fishing or simply a tourist who enjoys beautiful scenery let La Paz be the gateway for your next visit to this Baja paradise. Let the expert staff of our in house adventure travel office of Sea & Adventures/Mar Y Aventuras help you plan your excursions in and around La Paz.